Poland's impressive national shrine shelters plenty of superb church art. Krakow’s central Grand Square (Rynek Glowny), the largest plaza of medieval Europe and one of the world’s finest with its spectacular landmarks, has remained the hub of the city since the 13th century. 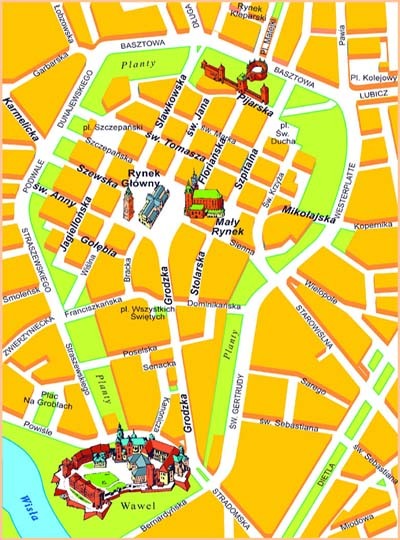 Krakow residents and visitors come here to meet each other, to do business, to shop, and to enjoy themselves. The immense Gothic church, Krakow's principal temple since the 13th century, shelters the world's greatest Gothic sculpture among its many excellent works of art. Park of 30 varied gardens among old trees round Krakow's Old Town historical district. 15th-century impressive Grand College of Krakow university where Copernicus once studied.